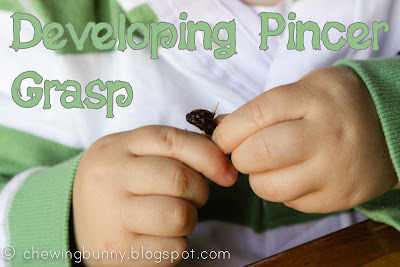 Pincer grasp is what enables a child to pick up and object with their thumb and index finger. It's an important pre-writing skill. We've already been developing this skill with simple activities like using tongs and tweezers, posting toothpicks through holes in jar lids, using eye droppers and stringing beads. I decided to mix things up a little today and what better way to inspire Felix than to use food! My boy loves his food. At snack time I presented him with a plate. It had a serving of raisins and some toothpicks. I showed him how to pick up a raisin and hold it so he could skewer it onto the toothpick. 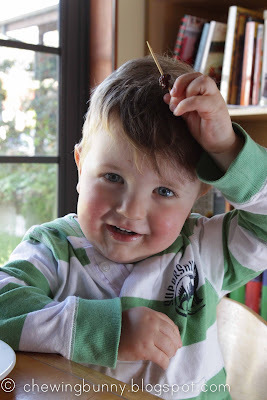 The idea being that he'd skewer a raisin onto each end of the toothpicks and when they were all full he could eat them. 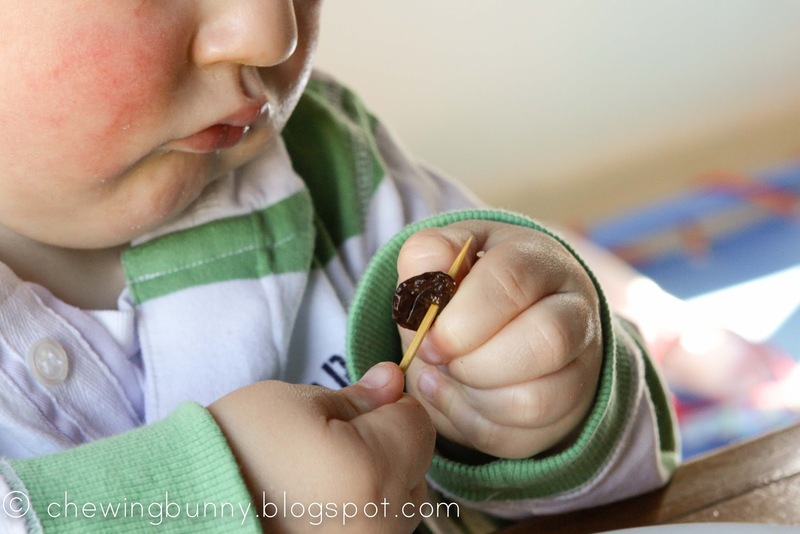 What actually happened was that he would skewer a raisin on each end of the toothpick and then eat them before moving on to do another two. This was a perfect activity for Felix. 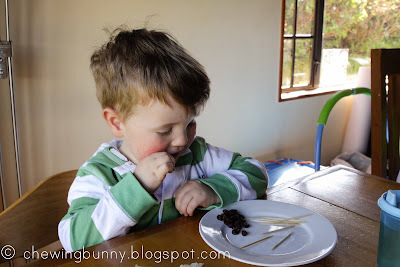 It was tricky enough that he had to concentrate on getting the toothpick through the raisins but relatively simple so he mastered it quickly and modified so he was pushing the raisins all the way down the toothpick and also putting 3 or 4 on at a time. 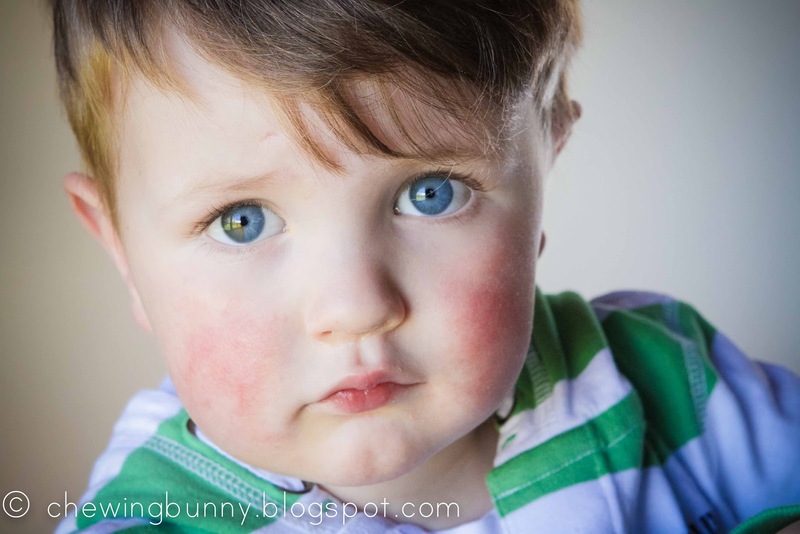 He got through the raisins I gave him and requested more. How could I refuse. It was beautiful to see such absolute concentration on his face. 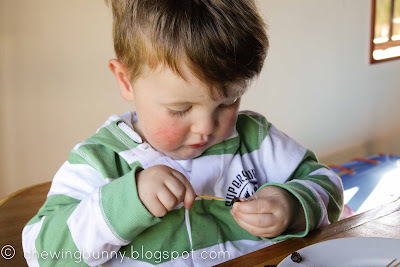 He sat there for at least 20 minutes fully absorbed in the activity. At the end he showed such pride and happily posed for a photo with his accomplishment. Great idea! I just love the built in motivation, natural rewards at their finest!